Hollywood Life caught up with Snooki in New Jersey where she’s been rehearsing non-stop for the new season of Dancing With The Stars. She comments about rehearsals and how hard they’ve been. She also mentions which celebrity makes her the most nervous to compete with. The star of MTV’s Snooki & JWoww, has been training for DWTS in New Jersey, and she plans to fly back from LA each week, to spend time with her son Lorenzo. But even though she’s training all the time, Snooki tells HollywoodLife.com that she’s really nervous about taking the same stage as former High School Musical star, Corbin Bleu. But by the sound of Snooki’s rehearsals, it sounds like she’s working her tail off with her dance partner Sasha Farber. E News talked with the cast of Dancing With The Stars. You can watch below for how they are weathering through their rehearsals. You can also see Elizabeth and Val dancing in a video at this E Online link. Thanks to @DWTSgossip for these finds!!! ABC Media Net has released voting and show information!! Most of it we know already, but, pay special attention to the instructions for how to VOTE and how the first elimination will take place!! “Episode 1701” — “Dancing with the Stars” is back with an all-new cast and fresh show format. The competition begins with the two-hour season premiere, live, MONDAY, SEPTEMBER 16 (8:00-10:01 p.m., ET) on the ABC Television Network. “Dancing with the Stars” will shake things up this season by transitioning to a one night, two-hour format. The premiere episode will kick off with a spectacular opening number featuring the entire cast. Each couple will then perform a Cha Cha, Foxtrot or Contemporary routine, vying for America’s vote for the first time. Beginning with the second episode on Monday, September 23, one couple will be eliminated at the end of the show by combining the judges’ scores from the first two weeks with the public votes from the previous week. Stay tuned to the Bethenny Show today. Pro dancer Maks Chmerkovskiy will be on the show. Above is just a little teaser pic of he, Bethenny, and a fan. For those interested in seeing more phhotos, see Zimbio Pictures. 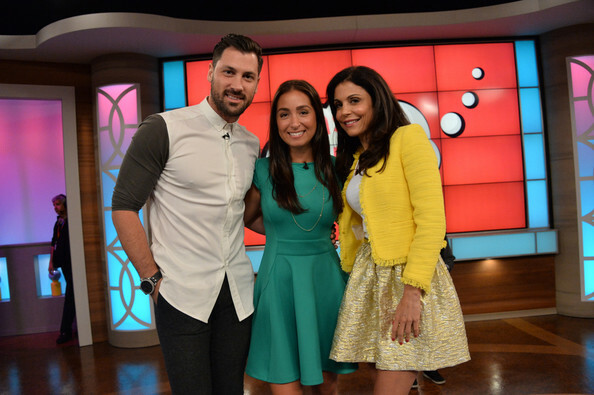 Also, below is Bethenny and Maks making the fan’s dream come true. If you’d like to see more, check Bethenny.com for a link to see the full episode after it’s aired today in case you aren’t able to watch it or you miss it.